Usually, when a football club wins several consecutive titles or clinches a big game or strings a few passes together, all the other teams start looking for weaknesses: a dodgy left-back here, a temperamental striker there. Barca’s success has elicited a different kind of reaction, however. On the whole, teams don’t want to defeat tiki-taka; they want to emulate it. After the 2011 final, AS Roma convinced Barcelona B coach Luis Enrique to try his luck in Italy. A year later, Manchester City hired Txiki Begiristain, one of Barca’s most influential administrators. Since joining Liverpool, Brendan Rodgers has talked constantly about His Vision and The Barcelona Way. According to pretty much everyone, Lionel Messi is the best player in the world, Barca plays the best football in the world, and Xavi should have won the Ballon D’Or, like, at least once. Disagree at your peril. Barca attempts to track the origins of Pep Guardiola’s Barcelona, to describe its players, coaches and tactical philosophy. Hunter, an experienced football journalist, writes a column for ESPN FC. He has 95,318 Twitter followers (about 30,000 fewer than La Liga expert Sid Lowe, but who’s counting?) He appears on podcasts, engages in online debate, and reports for Sky Sports News. He clearly knows a lot about Spanish football, but his book is embarrassingly sloppy and frustratingly biased. Barca is filled with sentences like these: “They have a steel core of confidence, and that’s what champions are made of”; “History was about to be written, but the theme of Guardiola being too easy to undervalue, a recurrent one in his story, took over briefly”; “Punctuality, as a representation of being mentally prepared, became equally strictly enforced”; and “The conclusion that Guardiola’s time management has been brilliant is inescapable.” Hunter uses the word “utterly” about three times a page, often in conjunction with clunky or clichéd phrases such as “competitive hunger” and “augmentation of confidence.” He writes that Guardiola’s “life should have been sweeter than Turkish Delight dipped in Nutella,” a bizarre, slightly nauseating metaphor. Hunter’s descriptions of Barcelona matches are equally pedestrian – and therefore at odds with the beauty of Barca’s football. On the famous 1-1 draw with Cheslea: “[Messi] picks up Essien’s air-shot at clearing the ball and…he thinks. Despite being the best dribbler of the ball in the world he controls the loose ball, looks to see who is well-placed and gives Iniesta every chance of a good strike at the ball with an inch-perfect pass.” David Foster Wallace is the only writer I’ve encountered whose prose captures the essential intensity of sports action – and he wrote about tennis. The conclusion that Hunter’s goal descriptions have been terrible is inescapable. At times, Barca devolves into an FCB love fest. 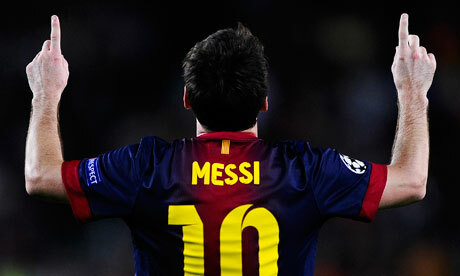 Hunter references “the greatest glory in the club’s history,” asks you to “watch Lionel Messi write footballing history,” and “[defies] you not to be moved by this glorious team.” In the book’s introduction, he writes, “I genuinely believe that the current FC Barcelona era, its football and its personalities, has given us something which, if not unique, I don’t expect to see rivaled, let alone equaled in my lifetime.” The book is titled The Making of the Greatest Team in the World, for heaven’s sake. Sergio Busquets used a racial slur? Hunter either doesn’t know or doesn’t care. Diving? What diving? In April, Bayern Munich crushed Barcelona in the Champions League semi-finals. Last week, Brazil beat Spain 3-0 in the Confederations Cup final. Bayern and Brazil play aggressive, counter-attacking football; their style differs from Barca’s in almost every conceivable way. What annoys me most about Hunter’s book (and, by extension, the wider world of Barca mania) isn’t so much its constant, unquestioning adulation as its implicit assumption that tiki-taka is the only style worth cultivating, that Europe would be a much better place if every team employed possession-oriented tactics. Don’t get me wrong: I love Iniesta and Messi. But I also love footballing variety. Arsenal-Stoke matches – clashes of style – have produced some of the most exciting football in recent Premier League history; watching Cesc Fabregas and Dean Whitehead share central midfield is a singularly wonderful experience. I enjoyed Tony Pulis’ Stoke team, and I’m afraid that Mark Hughes will try to turn it into a poor man’s Barca. (Last week, Hughes signed Spanish U21 defender Marc Muniesa from, you guessed it, Barcelona.) I’d much rather watch a small team like Stoke gradually refine an inherently imperfect strategy like “kick-and-run” football than watch the same team struggle to create passing triangles. There’s nothing wrong with Barca’s philosophy. But tiki-taka is not, as Hunter seems to think, the be-all and end-all of modern football. Great article! Not all of us Barcelona fans believe the tiki taka is the only style worth cultivating or even watching. Heck, I enjoy watching football from many other leagues. With respect to Barcelona, if there is one thing we learned from the 2012-2013 season is that all football philosophies have to evolve – or be doomed to be left behind by history. The trashing by Bayern Munich during the Champions League illustrated some inherent weaknesses in the Barca of 2012-2013 – and they were not all due to Tito’s illness or the injuries sustained by key players. The magnificent team that Pep inherited and then elevated to the best ever in football history (a personal opinion) could only be sustained for some time. I felt that even without Tito’s absence there was already a change taking place in the way the team played – far less intensity and a much weaker defense, plus an inability to maximize its offensive potential. I see the incorporation of Neymar as part of a decision to evolve the Barcelona philosophy and to revitalize the team with this great new player. Any doubts people had about his maturity, skills and potential were largely eliminated with his performance in the 2013 Confederations Cup. Now with Tito’s resignation, we do not know at the moment who will be the permanent replacement, nor the direction in which the club will be headed. Will they hire somebody who is part of the Barca school or someone altogether different? Time will tell. If you get a chance, take a look at my new website (http://neymarjr.info). It is brand new but I hope to develop it so that it offers high quality content like inforthehattrick.net. I think you’re right — evolution is absolutely essential. It’ll be interesting to see how Barcelona changes over the next couple of seasons.